The Halifax B Mk IIIa is a Rank II British bomber with a battle rating of 4.0 (AB/RB) and 4.3 (SB). This aircraft was introduced in Update 1.59 "Flaming Arrows". The Halifax is an interesting member of the British bomber line. It is the first true British heavy bomber, a big change from its predecessors, which are all either flying boats, medium, or light bombers. With the transition to heavy bombers, comes a change in tactics. 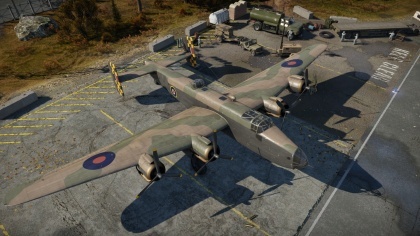 The Halifax will out class almost every tier 2 and 3 bomber in terms of payload. It will also generally beat every same BR bomber in payload as well. However, being a heavy bomber has its draw backs. Compared to nearly all previous British bombers, this one is slower, and has a noticeably slow climb rate. While the payload upgrade is nice, the Halifax is not very durable. Worse, the Halifax lacks effective defensive weapons, a flaw of nearly all British bombers. The main priority, as a result, should be targeting bases, and avoiding opposing pilots as much as possible. Use high altitude and less direct travel routes to get to your targets. If you are engaged, your defensive guns can save you, but they are not very reliable. In addition, you have no ventral turret, leaving a massive defensive gap. If you can keep safe, and deliver your payload, you will find this to be a very effective bomber. 541 260 ??? ~?? ~? 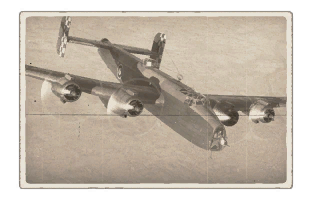 The Halifax B Mk IIIa can be outfitted with the following ordinance"
Can carry an overwhelming 12,000 lb of bombs, giving it the heaviest payload at tiers 2 and 3 and outclasses many tier 4 bombers. (Realistic Battle) Full payload lets it take out all three bases in one pass with two 1,000 lb bombs to spare (first base : 6 x 500 lb + 1 x 1,000 lb / second base : 3 x 1,000 lb / third base : 3 x 1,000 lb / airfield : 2 x 1,000 lb. Fantastic climb rate with WEP; can easily reach 6,000 m with full payload just by side climbing (which is heavily advised to minimize interception).